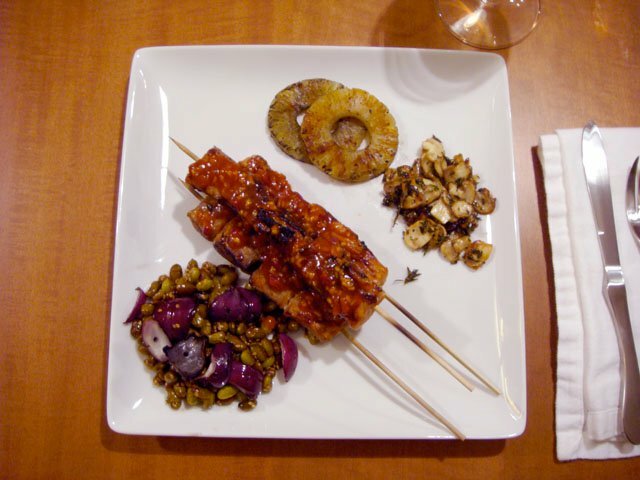 Grilled Pork Skewers with Red Curry BBQ Sauce – Top Chef Night | Eat.Drink.Life.Love. In this episode, the season 4 chefs had to run around a Chicago neighborhood collecting food from pantries and chef it up for a block party. We decided to not run around the neighborhood, but instead to take the opportunity to celebrate the tail end of grill season with Dale’s grilled pork skewers with red curry barbecue sauce. The recipe calls for copious amounts of everything because they were cooking for a whole neighborhood, so we cut it down substantially and went with about 3/4 of a pound of Nieman Ranch pork (not tenderloin, which I couldn’t find) and about 1/4 of everything else. For the edamame marinade, I substituted equal parts of lemon and lime juice for yuzu juice which I could not find. I added the soy sauce, a little bit of chili oil (I don’t like things as spicy as K does), the sesame oil and sesame seeds to a bowl and put in about half a package of frozen edamame. Then my favorite part of cooking — I set the bowl aside and left it alone. K started marinating the mushrooms and went about the tedious task of plucking thyme leaves off tiny, tiny branches. He also added sherry vinegar, honey, olive oil and the herbs to the sliced mushrooms and again — we set it aside and left it alone. We tasted our way through building the red curry barbecue sauce because the measurements were so out of whack. We balanced the sugar and the red curry and added just enough tart with fish sauce and lime juice. K cubed the pork and gave it a toss through the barbecue sauce then threaded it onto bamboo skewers (which we’d soaked to prevent from starting on fire). We also tossed some red onion pieces in a little bit of olive oil. In the dark, K fired up the grill on the deck. Despite it’s uneven cooking history (one side gets really hot and chars the life out of food and the other side is an extremely looooow heat), K put the pork skewers, red onions and some pineapple rings on the grill and stuck around in the warm evening (with a flash light) to make sure the goods got grilled. Back indoors, I poured the edamame and marinade into a hot pan and let it simmer and did the same with the mushrooms in a hot skillet. At about the same time the mushrooms and edamame were finished, K came back inside with some tasty-smelling pork skewers (and two hungry dogs nearby in his wake). The plates were assembled and we bit into the tender, curried pork. The rich, piquant meat was complemented by the sweet and smoky pineapple. The mushrooms were earthy and herbaceous and the edamame popped with freshness and salt. Yum, yum, yum. When grilling season comes around again, we’ll be putting red curry barbecue sauce on chicken and pork and giving this another go. As a side note: K also believes the red curry barbecue would make a great base for chili. Watch out Chili Classic 2011!